To this day, the White Cliffs remain one of Montana’s beloved scenic wonders. While civilization has encroached on many areas that the Corps of Discovery visited, the White Cliffs of the Missouri remain relatively untouched by the modern world. This geological formation is but a part of the Upper Missouri River Breaks, a series of badland areas that were proclaimed a national monument by President Clinton in 2001. The Breaks encompasses 495,502 acres with the Missouri River forming its western boundary. Much of the area is not accessible by road and travel can be difficult even for vehicles with 4-wheel drive. This is why many visitors to the Breaks choose to travel by water, canoeing, rafting, or kayaking the Missouri River. And one of the most traveled sections of the river is along the White Cliffs. The Breaks’ exceptional scenery includes an abundance of wildlife. Eagles, falcons, and hawks nest along the cliff faces. The area is home to one of the largest bighorn sheep herds in the United States and the most viable elk herd in Montana. Alongside the Breaks, the Wild and Scenic Missouri River contains one of six remaining paddlefish populations in the United States, along with sturgeon, sicklefin, and many other fish species. The history of the Breaks is equally as impressive as the wildlife. In the White Cliffs section alone, floaters on the Missouri River pass three Lewis and Clark campsites, Native American habitation sites, and remnants of 1900s homesteads. Cowboy artist Charlie Russell found the Breaks so beautiful and interesting that the area became a model for many of his paintings. River tours through the Breaks are offered by numerous outfitting companies, but the White Cliffs section is mild enough that most well-prepared amateurs can float the river without a guide. This 46-mile stretch offers hiking, fishing, and sightseeing opportunities with BLM designated campsites along the shore. 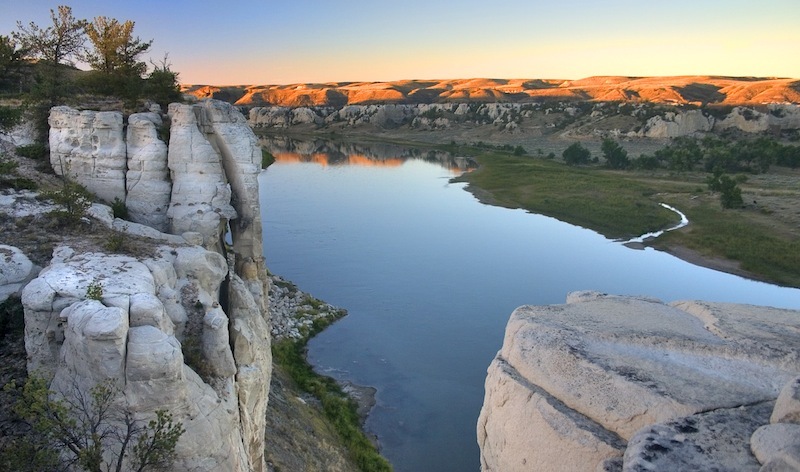 The White Cliffs section of the Missouri Breaks starts at Coal Banks Landing, northeast of Virgille, and ends at Judith Landing, northwest of Winifred. For more information, talk to your local river outfitter or visit blm.gov.